« What would OSHA say? 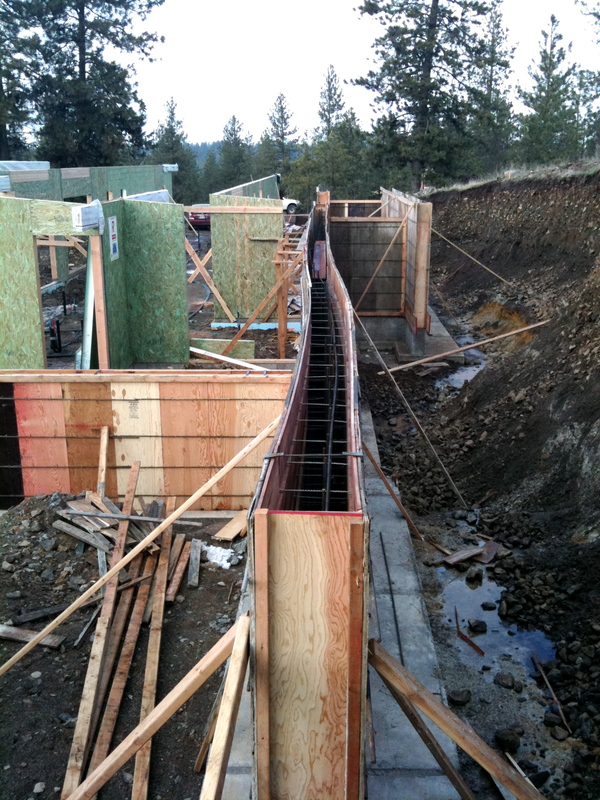 Without sounding like a broken record–or iPod–we have a lot of board formed concrete in our project. If you’re new to reading this blog and want a description of what I’m talking about, you might check out this post. I haven’t asked quite so bluntly, but reading body language I think the concrete team has more than a little bit of project fatigue, and are ready for the next big pour. To be clear, building board form walls is seriously labor intensive. And we have a lot of walls. Hence a lot of labor. 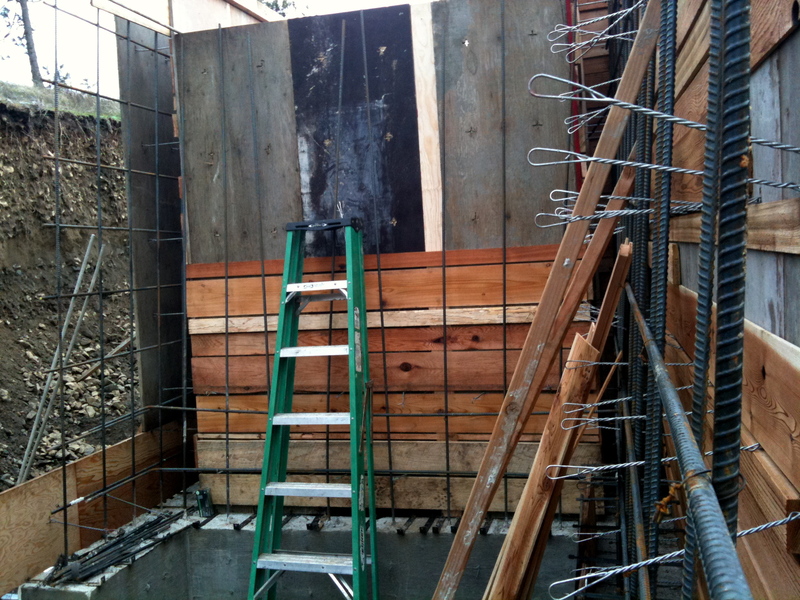 From early in the design phase knew we wanted board formed walls in our project. Finding out more about the process, and identifying a good contractor though, was more difficult than I expected. Googling “board formed concrete” didn’t help too much. Mostly I found a lot of examples of very expensive residential or commercial projects, with little information about how to do it or what it costs. An aspirational look. Bill Gates evidently saved up some benjamins for this project. Along the helpfulness spectrum, that suggestion was pretty far to the left. Aluminum channels and framing lumber. So simple. So handy. So, this is all a long build up to walk through how Mikel and his team created our walls. Our contractor, Carrie, has some experience with board form work, and what we’re doing is similar to how she created walls in her own house. 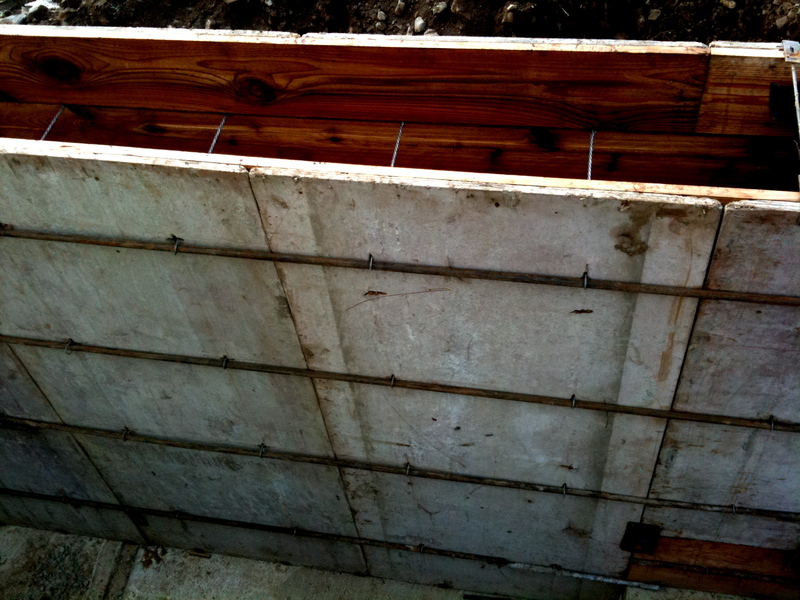 We start with forming walls like you would for normal, smooth-walled concrete using plywood and snap-ties. Standard forms on the outside. Cedar on the inside. 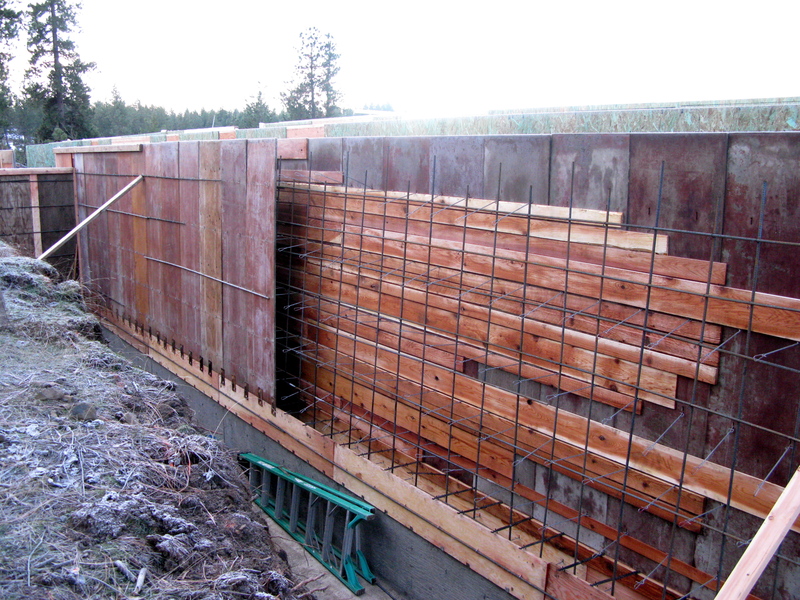 Once the first side of the wall is up though, Mikel nails rough-sawn cedar to the inside. 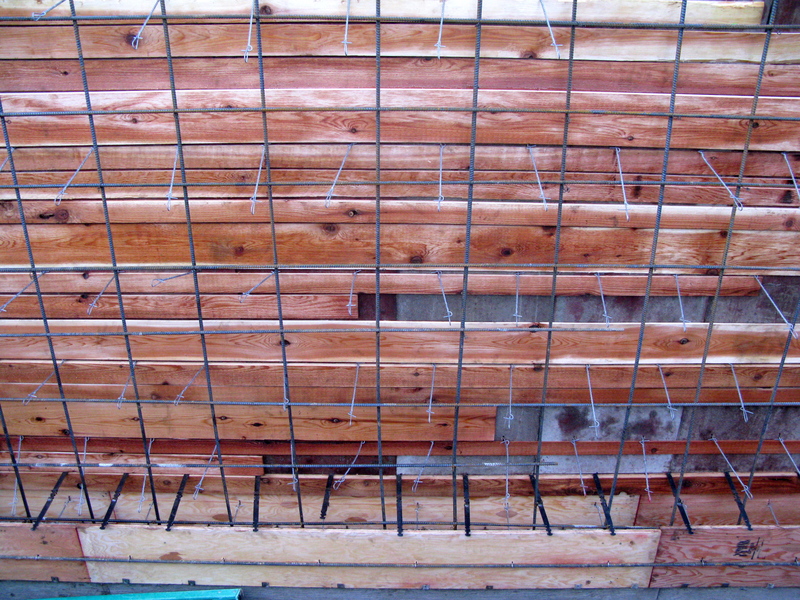 A lot of people use fir 2 x 4s, or 2 x 6s–wood that’s typically used for framing. This gets expensive though, and the fir tends to flake off and get stuck in the concrete. 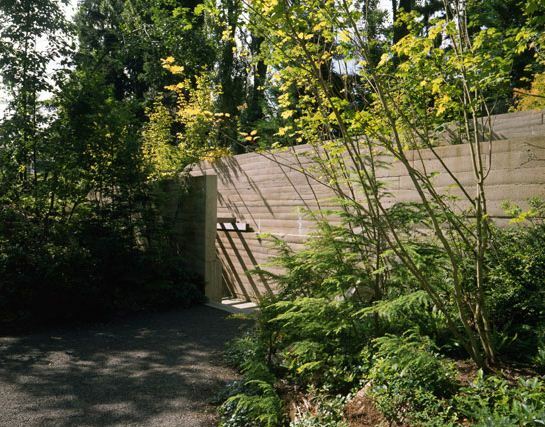 It also doesn’t leave as much of an imprint in the concrete as cedar–a quality we want. Then Mikel needs to figure out how to work around the snap-ties. 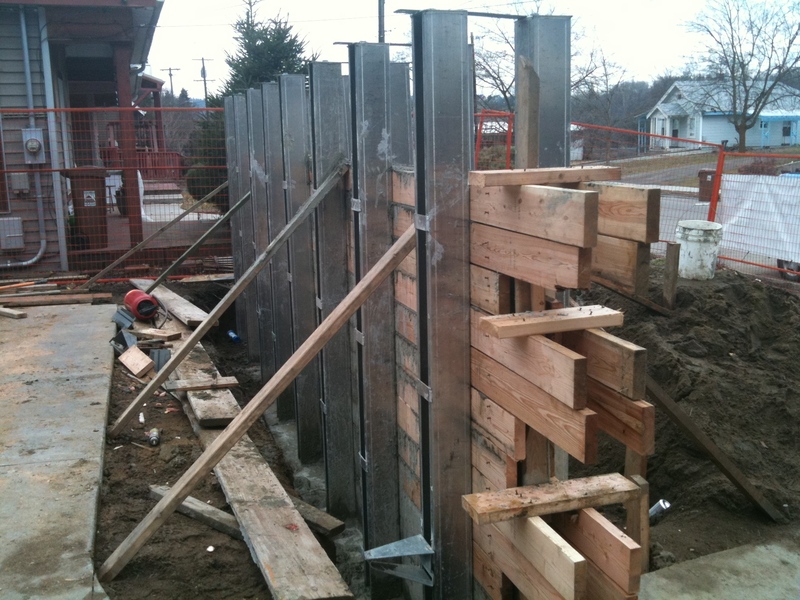 These are used to keep the plywood forms stable during the pour. If you’re not familiar with concrete, as it’s poured and set, it exerts a tremendous amount of pressure on the form work. The ties hold things together. Boards run above and below snap-ties. You can see the variety of wood thickness here, too. However, the snap ties can get in the way of the cedar boards. The way we worked around this is to use a variety of board heights. You’ll see this in our wall. We may have an 8″ piece of cedar, then a 4″, then a 6″, 2″, etc. I love the variety. Very cool. The other thing we did was use a variety of thickness of cedar. Again, this will get picked up when the concrete is poured, and I think what we’ll end up with is a wall that looks a bit like an old ruin. 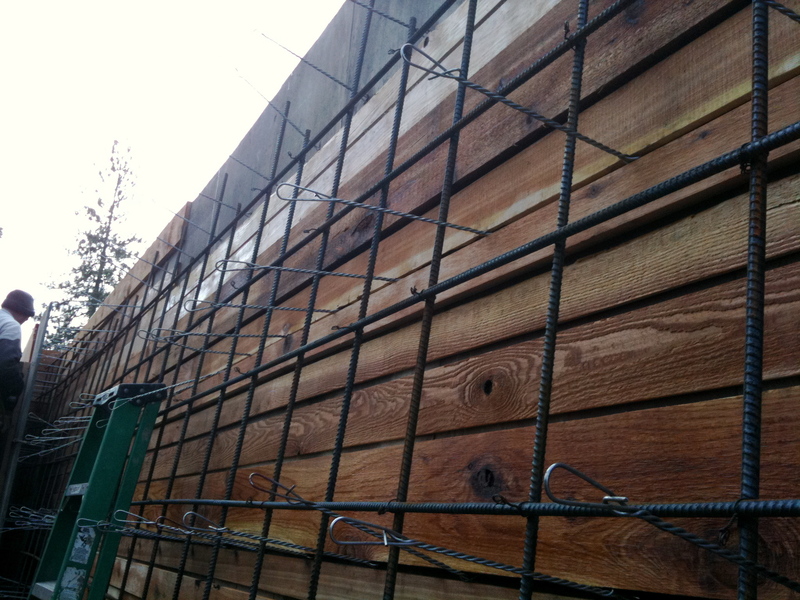 I found the cedar for this project on craigslist for a great price–59 cents per lineal foot. This is the upside of the end of the building season and a down economy, I guess. The material was all 1″ x 8″, and 7/8″ thick. So we sent it to a big shop and had it ripped in half. This effectively doubled the amount of wood we bought and now have some material that’s 7/8″, some that’s 1/4″ and some that’s about 1/2″. Mikel is mixing these in randomly. The big pour happens early next week. 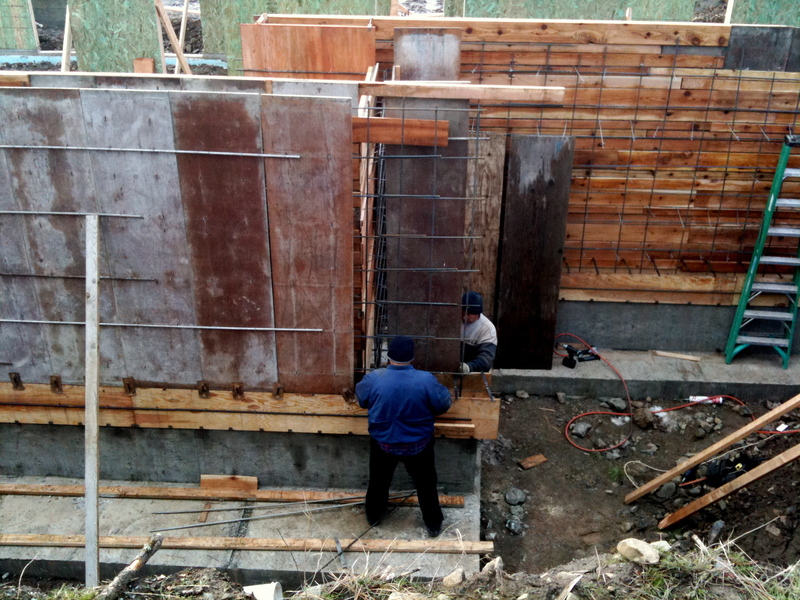 The boys have about 30 feet more of wall to construct, then want to take a day or so to get the bracing right (remember the big pressure from the concrete?) and to get the walls perfectly straight. This will be damn straight(!) before the pour. What is the different of FORMED CONCRETE or Cast in Place concrete? because Cast in place concrete is also need form. Well, I’m not a concrete contractor so might get over my skis here. 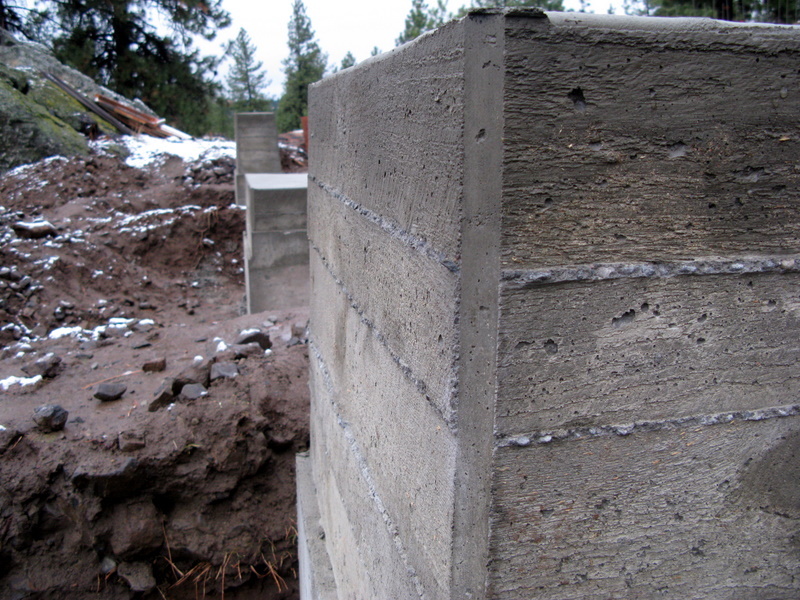 But…yes, cast in place concrete requires a form. Otherwise you’d end up with a giant blob of concrete that would look like a giant petrified ant hill. So our walls were indeed cast in place, something essential considering it required 6 or 8 trucks and well over 200 yards of concrete. What made our project somewhat unique is that our walls were BOARD formed–meaning we used cedar boards instead of smooth plywood, which lends a pretty distinct look and texture. I wonder if you’re thinking of the different between Cast in Place and Pre Cast concrete. Pre Cast is typically a piece of concrete that’s formed in a factory setting. For example, a concrete fire pit, highway barriers, concrete railroad ties, etc. Hope this helps! Every concrete is gernerally formed concrete. Cast-In Place simply mean that forms are erected on the site where they will remain so the concrete is casted in-place of its final location. Other than pre-cast concrete which is made off site for example in a factory and then shipped to site to be assembled. This is often used where the architecture and structure allow it to be more time efficient and less weather dependent that cast-in place concrete. But 99% of all concrete applications are formed concrete. I hope this helps. I am a concrete contractor in Edmonton/ Canada. I came here 6 years ago from Germany. What is your average p/sf or p/lf? I have done the same type of pours in the past using conventional concrete forms lined with wood. I would not use cedar now as it is too valuable a wood to be used as a throw away material. Rough sawn pine will give the same imprint and is grown as a forest product. We are trying to do a board form wall and have been experimenting with mock ups to get the desired look. The issue we are having is when we pull the forms we have air bubbles that have left thousands of small holes in the grain which looks horrible. We use a good form release agent and have experimented with various levels of vibration to remove these with no luck. Has anyone experienced this issue or found a way to avoid this? Hi Bryan. Sorry for the delay. I’ve gone a bit dark with this blog! I’m not sure what to suggest given that my experience is limited to our own project. The thing that stands out though is to ask what kind of wood you’re using. Certain woods–pines like ponderosa or fir for example–tend to show less grain. Cedar on the other hand (what we used) does a good job of transferring its grain. And while we have a few air bubbles, they’re pretty limited. Hope this helps! Any final pictures of the walls/house complete? Hi espiritiv… I’m super far behind on posting. The best I have right now though is what’s on the home page, a few posts down. So…the three photography entries. Send me a note if you’re looking for something more specific. Always happy to share! Very nice work. Was this a regular concrete mix? 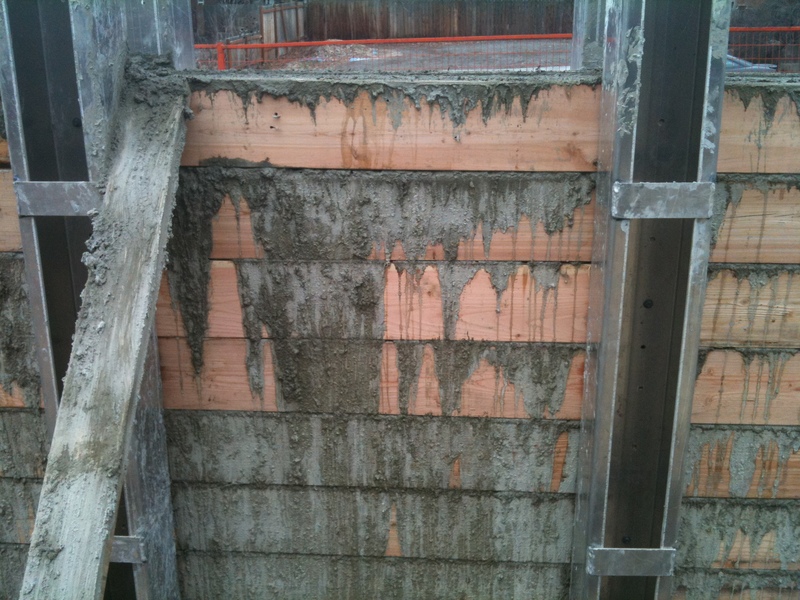 I ask because I’ve heard that self-consolidating concrete is often used with board formed. Jackson, yes it was a standard mix. Hope this helps! Yes, it does help! Thank you. Hey there…. I like the valuable information you provide in your articles. I will bookmark your weblog and check again here frequently. I am quite sure I will learn many new stuff right here! Best of luck for the next! Thank you so much for sharing. Amazing. Love to try it.